What celluloid fantasy fan doesn’t have a strong opinion on The Hobbit: An Unexpected Journey, the first installment in Peter Jackson’s three-film adaptation of J.R.R. Tolkien’s beloved 1937 novel (and one of the 2012’s most successful and buzzed about films). The Hobbit tells the fantastical tale of the hobbit Bilbo Baggins’ titular adventures with a group of dwarves as they travel across Tolkien’s mythical land of Middle-Earth to reclaim the dwarves’ mountain homeland and a treasure of gold from the fire-breathing dragon Smaug. It’s a genuinely fun, involving and heartfelt story, one that Tolkien famously wrote with children in mind—it’s first and foremost a book for the young ones—and a work that laid out the narrative background and mythology for Tolkien’s more adult-geared Lord of the Rings trilogy, which he wrote over the decade following The Hobbit‘s publication. 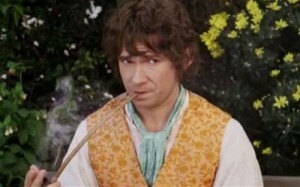 Martin Freeman is Bilbo Baggins in The Hobbit: An Unexpected Journey. Like Tolkien, Jackson obviously put his heart into The Hobbit, just as he did his award-winning, instantly classic adaption of the epic Lord of the Rings trilogy. But Jackson’s The Hobbit is simply too much—too long and too rich, like an unending banquet meal. By sourcing the original novel, various appendices that Tolkien later wrote alongside Lord of the Rings, and his writing team’s additional ideas that narratively and thematically connect The Hobbit the The Lord of the Rings movies, Jackson has created the kind of monster one might bump into during a trek though Middle-Earth’s Misty Mountains. I’m not a Tolkien fanatic, but the idea that the filmmakers supplemented Tolkien’s book with a sizable amount of their own ‘fantasies” left an unpleasant feeling in my tummy even as the highly visual feast was being consumed. For me, the end result didn’t “taste” like The Hobbit, but rather like a lesser variation on The Lord of the Rings. And we’ve already seen and read that one, haven’t we? Not that Jackson and team’s sounds and visions aren’t stunning. It’s a gorgeous production, filled with striking environments, production designs, costumes and performances, particularly those of the charming Martin Freeman (TV’s The Office) as Bilbo and returning star Ian McKellen (X-Men: The Last Stand), who is so perfect in his role that I think he might actually be the wizard Gandalf. And The Hobbit certainly delivers grandly on Blu-ray. But, as is the case when the entrée is super-sized, there are a number of long and tiring stretches, and a whole lot of CGI effects—too many—used to create the many fantastical characters, atmospheres and action set pieces. One energetic scene, set in a goblin-filled cave city, proceeds like a high-speed videogame and nearly had me reaching for my Dramamine. Come to think of it, the most effective scene in the film was one involving only two characters, the sad creature Gollum (CGI/motion capture-crafted with Andy Serkis from the previous films) and the increasingly heroic Bilbo. It’s the most controlled, deliberately paced scene in The Hobbit—and the best. Considering the film’s gargantuan size, the supplemental package must be considered a a disappointment. The extras are led by two hours of video blogs hosted by Jackson, all ten of which were created while the film was in production—from its beginnings in the spring of 2011 up through the its world premiere in New Zealand in December, 2012. The material is all informative and worth seeing, but as it was all produced prior to The Hobbit‘s completion, it plays like an extended promotional piece. The only real new supplement is a lone featurette that tours the movie’s New Zealand production locations. Yes, there’s an extended edition containing 20 to 25 minutes of additional footage scheduled for release on DVD and Blu-ray later in the year and, yeah, it’ll probably include a slew of additional bonuses similar to the excellent ones we saw in the first DVD editions of The Lord of the Rings. But the idea of holding back so many goodies for the next edition, which will no doubt be issued on the eve of the theatrical release of the second film in the trilogy, isn’t helping to ease that queasy feeling in my tummy. All that said, don’t forget about Disc Dish‘s contest to win a copy of The Hobbit Blu-ray/DVD Combo. After you snag your own edition of the Blu-ray, you can tell us what you think! I totally agree with this review. I love J.R.R. Tolkien and “The Hobbit,” but this film dragged. I struggled to keep my eyes open.